Home :: Plaques &amp;amp; Gifts & :: U.S.M.C. 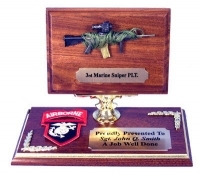 presentations :: 3rd Marines sniper Plt. Add the items of your choice to make the presentation that best expresses your needs. This is another of our many styles of plaques for you to choose from.